Two snowshoers were hiking along Colorado Highway 5, south of Echo Lake. Around 2:30 pm, they reached a spot where a steep wind drift covered the road. The victim, a 53-year-old male, slipped off the trail and slid down hill. As he climbed back to the road he triggered an avalanche. The avalanche swept him down about 250 vertical feet. Media reports said his dog found him very quickly, buried to his neck. The snowshoer's companion and a passing group dug him out and sent for rescuers. The snowshoer was alive when rescuers arrived, but died during the evacuation. 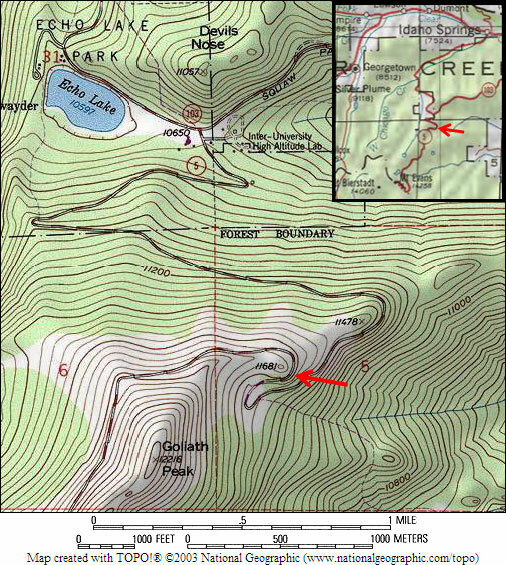 Map, with the red arrow indicating the accident location. 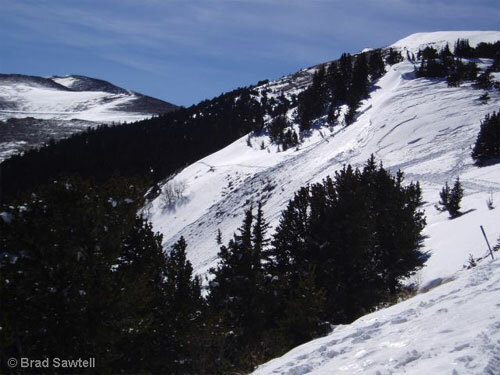 The avalanche occurred on an east aspect (100 degrees) at 11,680 feet. The snowshoer probably triggered it from a shallow, rocky area just below the road. Near the rocks, the windslab thinned to less than 1 foot thick. The avalanche broke into the drifted snow about 30 vertical feet above the road. The avalanche ran in a very windloaded gully, with over 10 feet of snow in the center of the gully and very shallow snow on the gully edges. The crown was 1 to 3 feet deep and 165 feet wide. The slope angle in the starting zone was 35-39 degrees, with the steepest slope angle 42 degrees. The bed surface was a dusty ice layer, the dust blowing in from the ridge above. 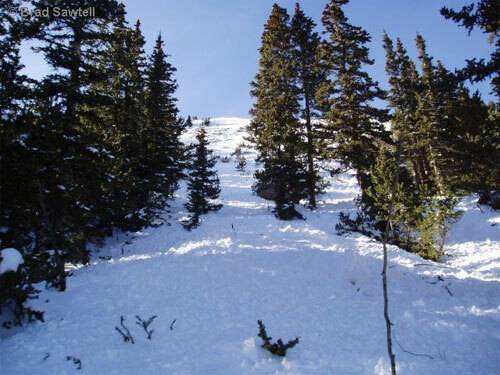 The avalanche ran 260 vertical feet into trees, with an alpha angle of 28 degrees. The gully narrowed, and the avalanche debris was less than 100 feet wide. Trees in the path were flagged and scarred well below the debris of the fatal avalanche. Looking south across the avalanche. The horizontal tracks follow the road. The avalanche was probably triggered from the rocks in the center of the photo. Looking north, from the south flank of the avalanche. The rocks in the foreground are the likely trigger point. Looking up from the toe of the debris. 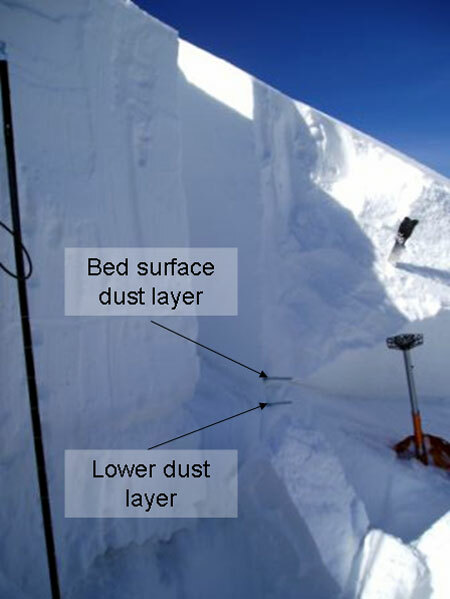 A profile near the crown line, with the dusty ice bed surface, and a lower duty layer. 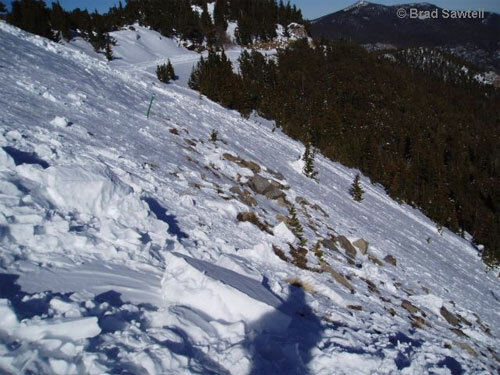 The avalanche danger for the Front Range, on both Friday March 2 and Saturday March 3 was "CONSIDERABLE on N-NE-E-SE-S aspects near and above treeline. Below treeline the avalanche danger is MODERATE with pockets of CONSIDERABLE on wind-loaded slopes that face N-NE-E-SE-S." The accident occurred on a windloaded east aspect near treeline.